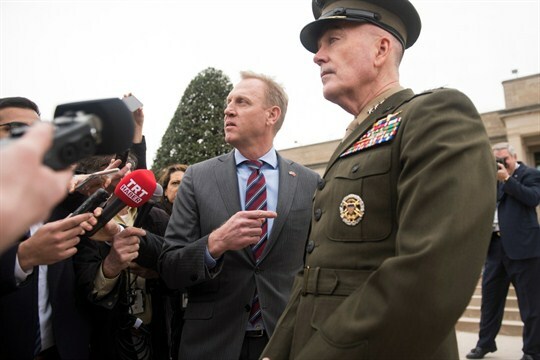 Acting Secretary of Defense Patrick Shanahan, center, and Chairman of the Joint Chiefs of Staff Gen. Joseph Dunford, right, talk to the press at the Pentagon in Washington, Feb. 22, 2019 (AP photo by Kevin Wolf). During the first two years of the Trump administration, the Department of Defense has curtailed the release of public information about its spending and operations overseas, as reporters have complained of declining access to senior leaders. In an interview with WPR, Mandy Smithberger, director of the Center for Defense Information at the Project on Government Oversight, explains how increasing secrecy at the Pentagon undermines democratic accountability and impairs national security policy.